Would you buy a television set if you knew it had been stolen, no matter how cheap the thief might sell it? Besides knowing that the television set belongs to a neighbour of yours? Knowing also that the thief illegally occupies the house of your neighbour and keeps him as a hostage? Of course not. Nevertheless, you will do something quite similar every time you buy fish in the nearby supermarket or fish market. The Western Saharan coast line harbours an incredible wealth: fish. Loads of fisheries products in our supermarkets originate from Western Sahara, but the label will claim otherwise. Why? Because the European Union has a Fisheries Agreement with Morocco allowing European vessels to fish in the territorial waters of Western Sahara, even though this territory – according to international law - does not belong to Morocco. Of course the European Commission will use another phrasing. According to the legal opinion of the European Parliament, fishing off-shore Western Sahara is not illegal provided that a share of the financial contribution Morocco receives from the EU is invested in development projects for the local population. But stealing is stealing, no matter how sophisticated the veil of hypocrisy used to cover it. Furthermore, the Commission’s argumentation is false. The fact that the EU presumes Morocco to be a benevolent administering power, indicates a wilful naïveté. Morocco is not the Administering Power of Western Sahara, and even less benevolent, as one can understand from the many reports that Amnesty International and Human Rights Watch have published on the human rights violations committed in the territory. Not only does Morocco consequently deny every UN resolution, it considers its sovereignty over “its southern provinces” to be irrevocable. 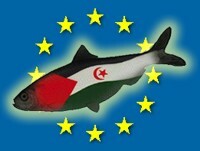 The European Commission may bend over backwards to claim the Fisheries Partnership Agreement does not prejudice the international status of Western Sahara, the truth is that it rewards an illegal and forceful annexation and constitutes one more obstacle to the peaceful solution of the conflict.